Over Christmas, Quine died: the sad but proper occasion to revisit his huge contribution to philosophy – in particular its relation to those currents of thought which most preoccupy RPʼs readers and contributors. ʻNot much of a relationʼ will say those who only acknowledge Quine as the doyen of the ʻAnalyticʼ paradigm from which they have self-consciously distanced themselves. They owe him far more than they think, or than he, perhaps, would have liked to think either. For a start, we wouldnʼt use ʻparadigmʼ as we do, but for him. Despite his pre-eminence in the Analytic ﬁrmament (and the American academic establishment), Quine was the most rigorous and subversive sceptic since Hume, with a scepticism all of a piece with Humeʼs, taking hostility to necessary truth further still. Like Hume and Berkeley, he pressed empiricism so hard it transmuted into idealism. But his scepticism regarding meaning is the very fulcrum of twentieth-century philosophy, providing the unassailably rigorous impetus to the swing to conceptual relativism in the latter half of the century. In the ﬁrst half of the century Analytic philosophy lived up to its name, pursuing an ʻanalysisʼ into simples of every meaningful complex proposition. It aimed to repudiate the leading currents of nineteenth-century philosophy (since continued as ʻContinentalʼ philosophy) through a retreat to Hume, so as to begin again avoiding any Kantian synthetic a priori, while at the same time recasting philosophy in the arena of language rather than that of conscious judgement. Quineʼs linguistic holism scuppered this vision of ʻanalysisʼ, and much more besides. Humeʼs scepticism rested on his dividing judgements exhaustively and exclusively between ʻrelations of ideasʼ and ʻmatters of factʼ – the ʻanalytic/synthetic distinctionʼ to us, since Kant. Quine utterly undermined this – showing that, in the attribution of truth to sentences, there could be no non-arbitrary initial, ﬁnal or necessary demarcation between the contribution made by experience and that made by meaning. No sentence was immune from revision in the light of experience, but, by the same token, ascribing truth to any sentence would make some contribution to the meaning of the terms it contained. All sentences were interwoven, thereby, into an inseparable fabric constituted by no more or less than the propensities to utterance and assent of the community of speakers. So there could be no unique equation of meaning between speech patterns found in separate communities. Moreover, speakers in one community could not even reliably assume that the expressions of a second community referred to items belonging to the domain of things that the ﬁrst community supposed to exist – their ontology. These twin theses – the indeterminacy of translation and ontological relativity – were framed within the apparatus logical positivism itself had supplied, so as to destroy from within its objectivist claims. 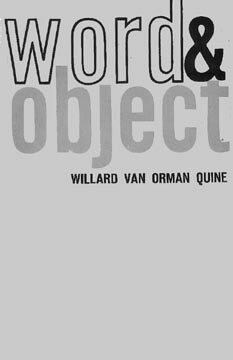 All who have since repudiated objectivism have done so in Quineʼs shadow – none more so that Kuhn, whose ʻparadigmsʼ are, in effect, what Quine had called ʻconceptual schemesʼ. ʻTwo Dogmas of Empiricismʼ holed objectivism below the waterline – it only remained to see how long it would take to sink. ʻBut Quineʼs work always gives the impression of dogmatic scientism.ʼ Yes, but… It was a major project in his later work to show that a wholly extensional ʻcanonical notationʼ comprising propositional and ﬁrst-order predicate logic sufﬁced to express all of natural science. And we could infer he felt that little more than that even merited expression. Nonetheless his work leads directly away from positivism: it is plainly idealist in its overall epistemology (albeit a linguistic idealism), while his underlying metaphysics harks back to Leibniz. This despite his project of ʻnaturalizingʼ epistemology and ostensibly rejecting the claims of any ʻﬁrst philosophyʼ. The thesis of ontological relativity is captured in his slogan that to exist is to be the value of a bound variable of quantiﬁcation. Rather than ʻesse est percipiʼ, to exist is to be referred to in some language. The entities to which any theory or conceptual scheme refers are the ontology of that theory or conceptual scheme. The ontology of our current conceptual scheme has no more standing than that. Referring cannot carry with it any extralinguistic guarantee that what we refer to is really out there. On the other hand, from within any conceptual scheme, we can tell when reference must have failed, namely when the supposed entity does not abide by Leibnizʼs law of the indiscernibility of identicals. Hence another of Quineʼs key slogans: ʻno entity without identityʼ and his identiﬁcation of ʻreferential opacityʼ as the malaise afﬂicting quantiﬁed modal logic and the propositional attitudes. In order for two expressions – say ʻScottʼ and ʻthe author of Waverleyʼ – to refer to the same thing, whatever is true of Scott must be true of the author of Waverley. The two expressions, as Leibniz puts it, could be substituted in any sentence salva veritate – saving the truth. A language meeting this substitutivity condition is extensional. This requirement notoriously fails to be met when referring expressions are used in intentional and de re modal constructions. So, for Quine, there are no sufﬁcient conditions for the success of referring, but a necessary condition for the possibility we might refer is that substitutivity can be upheld. Where referential opacity is found, failure of substitutivity undermines ontology, if to exist is to be referred to. To argue that existence is more than this, it seems, requires some variety of essentialist realism. In the absence of any necessary truth, Quine argued that such essentialism can only rest on dogma or prejudice. Thus Quineʼs restriction of science to a strictly extensionalist language (lacking intentional or de re modal idioms, and even subjunctives and causal necessity) is justiﬁed, in effect, by a quasi-Kantian appeal to the indiscernibility of identicals as a necessary condition for the possibility of reference. Ontological relativity, on the other hand, repudiates any quasi-Kantian thing-in-itself. So he frames an austere but full-blown idealism in terms of language rather than mind. Quine entirely repudiates foundations and prior philosophy, but his total rejection of essentialism leads to a radically revisionary metaphysics, based on unprecedented scepticism towards typically metaphysical topics. He takes identity to be a strictly logical notion, not retained over time, adopting a ʻtime-slicingʼ metaphysics and wholly rejecting the Aristotelian notion of a substance (not just personal identity). Nothing retains its identity through change over time, but Quine reconciles Heraclitan ﬂux (in three dimensions) within a fourdimensional Parmenidean stasis in which nothing changes – there is, he says, no ʻQuinean essenceʼ which unites the stages which comprise his life. The ʻextensionʼ of his extensional language is four-dimensional space–time, and all that needs irreducibly to exist is the totality of points within it, each deﬁned by four numbers against arbitrarily set Cartesian coordinates – full-ﬂedged Pythagoreanism. No predicate has any item in its extension which is not part of that totality of quadruples of numbers. ʻBut wasnʼt Quine a behaviourist, and hasnʼt Skinner been refuted?ʼ, you mignt ask. Quineʼs behaviourism does not anathematize hypotheses about what intervenes between stimulus and response. Whatever does so intervene does not come from outside nature; it cannot remedy the basic inadequacy of innatism as a philosophical explanation of meaning. To the question, ʻWhere do meanings come from?ʼ, the reply ʻThey were already thereʼ is simply not an answer. Quine set out to ʻnaturalizeʼ epistemology – to represent it as part of nature. The problem with the intentional is that it literally has no place in the extensional world, just like Hobbesʼs ʻghosts that are in no place, that is to say that are nowhere; that is to say, that seeming to be somewhat, are nothingʼ (Levaithan, ch. 34). So the peculiarity of Quineʼs philosophy, for all its clarity, rigour and radicalism, is that in the world he describes there hardly seems a place for the existence, as a real phenomenon, of the language in which it is described. Of course the sounds and inscriptions exist, but meanings are utterly abjured just because they lack identity conditions (that is what is wrong with synonymy), while intentionality and hypothetical reasoning cannot employ the apparatus of reference to connect with any reality. Quine says the indeterminacy of translation exceeds even the underdetermination of physical theory by observation. So that, were the totality of facts ever to be assembled which fully determined the content of physical theory, there would still be ʻno fact of the matterʼ regarding the equivalence of expressions. This is the renewed ʻscandal of philosophyʼ (as old as Hobbes): that all ediﬁces of human meaning are less substantial than castles in the air. No new Kant has come along to rebut it. Philosophers languish, or even ʻsleep furiouslyʼ in their dogmatic slumbers, or they mischievously scandalize us with a second-hand frisson, ﬁrst minted by Quine. The full importance of Quineʼs work in the history of philosophy will only be apparent when we see an adequate response to his scepticism. A great deal of revamped Aristotelian essentialist realism was and still is prompted by this scepticism – but this reveals latter-day Samuel Johnsons kicking stones down the streets of academe – despite its accompanying major advances in modal logic for which no satisfactory philosophical account can be found. Another overlapping trend has been ʻdescriptive linguistic philosophyʼ – lowering philosophyʼs sights to the mere delineation of our existing conceptual scheme, and even joining the Continental postmodernists in acknowledging its contingency. Others have sought to be more Humean than Quine, eschewing numbers even. A more sophisticated linguistic idealism has been developed by Davidson and others which can be roughly styled ʻinternal realismʼ. There have been major areas of rapprochement with Continental philosophy – some self-conscious, like Rorty, others all but unknowing and barely remarked upon as yet. (ʻCompare and contrast Davidson and Gadamerʼ remains a doctoral gold mine, for instance.) Meanwhile the philosophy accompanying ʻcognitive scienceʼ trades on the Quinean characterization of intentionality without taking the point that this precisely debars intentionality from science. (Davidson applies Quineʼs central doctrines regarding meaning to show there can be no psychophysical laws.) There are plenty of Quineʼs chickens yet to come home to roost. For, despite already having deprived it of any central doctrine, leaving only a unity of style, Quineʼs impact on Analytic philosophy has still to run its course.